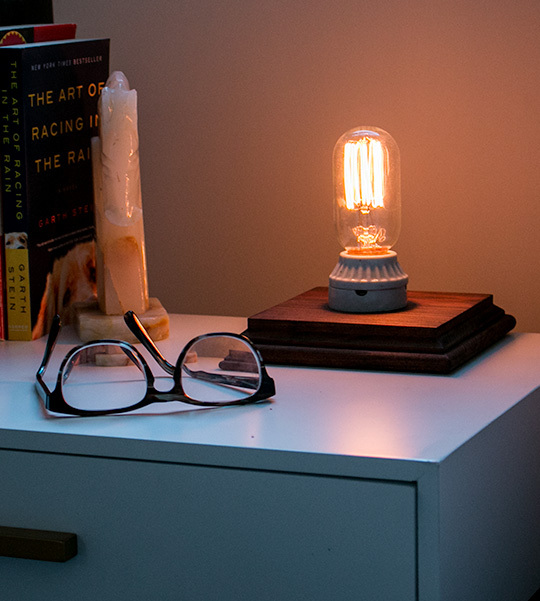 You won't believe how easy it is to make this beautiful, affordable DIY side table lamp. 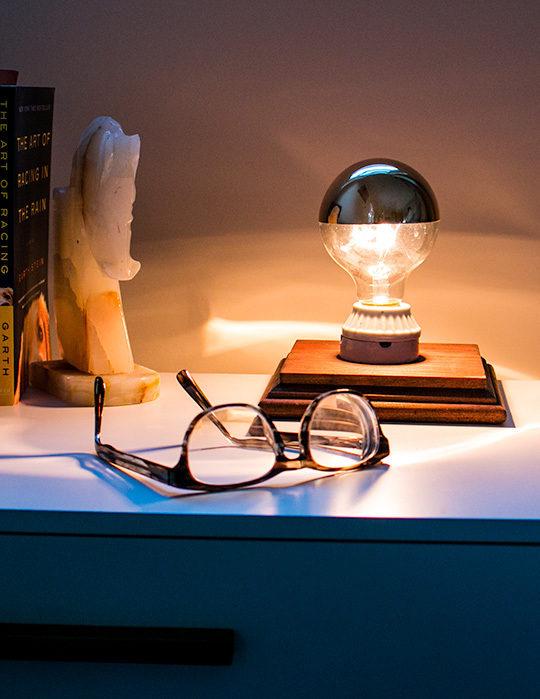 Low light side table lamps are a fantastic way to add ambient lighting to your place, as well as a little style. 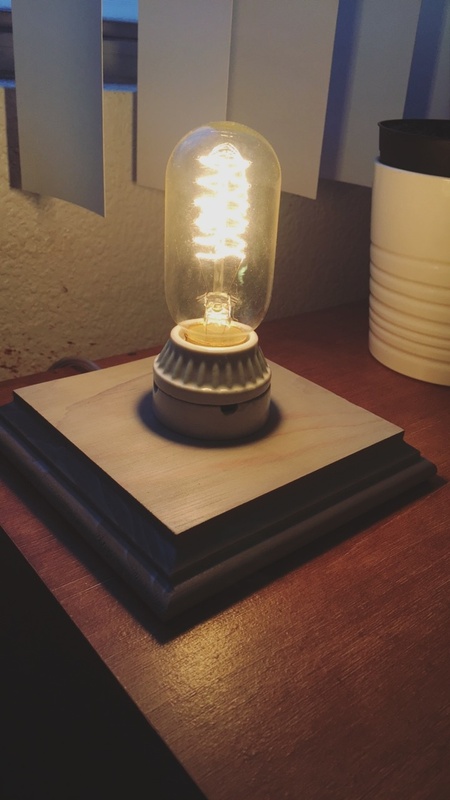 Today's DIY lamp project is incredibly easy to do and dirt cheap too! If you can drill a hole and turn a screw, then you're up for the job. We don't even have to cut any wood! Everything for this project is available at your local hardware or home improvement store. 6″ Redwood Post Cap / Finial Base, $3 – These are in the fencing area and are meant for giving a fence post a nice finished top. It's a beveled piece of redwood and looks great as the base for our lamp. Lamp / Appliance Cord, $4 – A standard replacement lamp cord (2 prong) for the non-charging version, or 3 prong replacement power supply cord for the lamp holder with the outlet. For the 2 prong ring socket, buy one with a switch on the cord, or you can easily install a switch. The switches will be in the same aisle as the cords. The outlet version has a pull string. Edison Style Filament Bulb, $5-10 – Available in a number of different shapes, including a mirrored version that you can see below. The post cap comes with a hole drilled through the center. We'll use that to run our wire up to the socket. If you're making the version with the outlet, you may need to make the hole a little bigger depending on how wide your cord is. 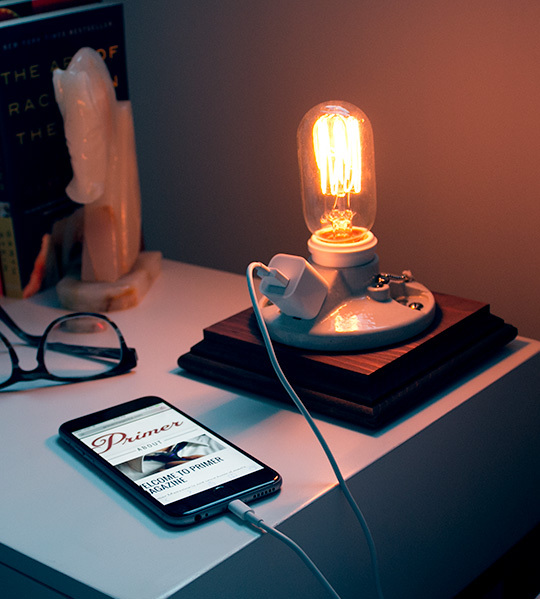 Wire your lamp holder based on whether you're doing the two prong or three prong version. This is incredibly easy, if you can turn a screw, you can wire these with ease. Just Google search “how to rewire a lamp“. The two (or three) wires are different, and one will have ribs or writing, and the sockets will have different colored screws indicating which wire goes where. Once the socket is wired, see if you're able to get it to sit flush on the post cap. 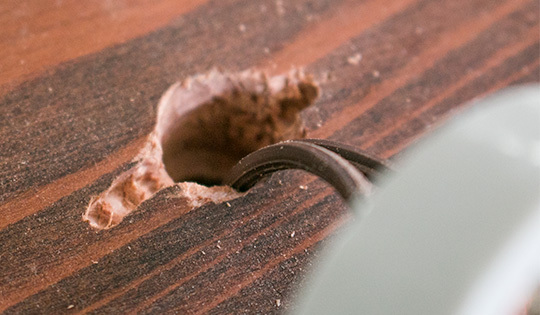 For the ring socket, you may need to use your drill to create small indentions on either side of the center hole for the wires to sit in. For the 3 prong outlet version, if you'd like your socket to sit in the middle of the post cap, you'll need to elongate the center hole on the side that the outlet will sit so the holder can sit flush and there's room for the cord. These will both become obvious once you do the dry fit. Undo the socket wiring and pull the cord through. We now need to drill a channel on the bottom side of the post cap for the cord to run through so that the lamp sits flush on the table. 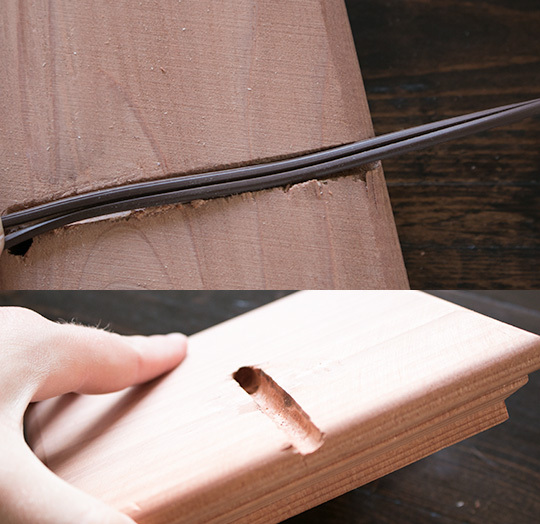 To do this, simply clamp the post cap to a scrap piece of wood, and use a large drill bit to drill between the two pieces of wood. You want the cord to run out the back of the post cap, so drill your hole accordingly. You can smooth the channel out with sand paper or a file. 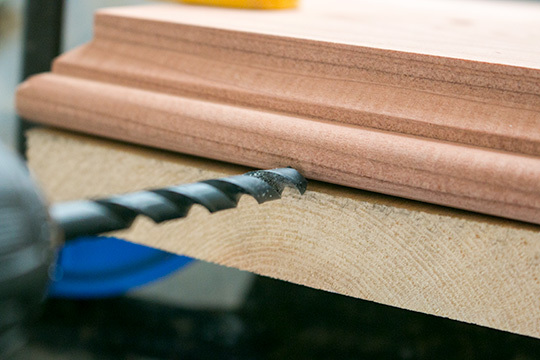 The post cap is made out of beautiful redwood, so you don't need to stain it if you like the look of it as-is. Staining is a super simple process if you've never done it. 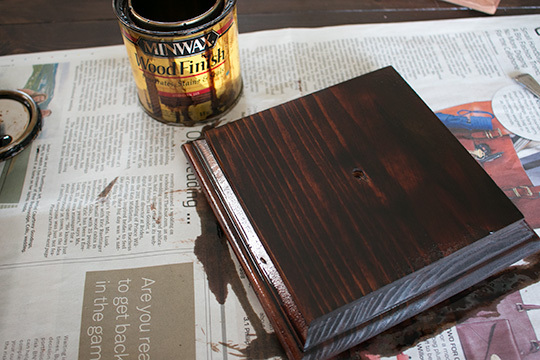 Just wipe on a thin coat of stain, let it sit for a minute, and then wipe off the excess. That's it! Let it dry before moving on. Run the wire back up through the center hole and rewire based on which socket you're using. Position the socket where you'd like it and mark the screw attachment holes. Drill a small pilot hole for each of the two screws, and then insert the screws to attach the socket to the post cap. That's all there is too it! What did I say, dead simple, right?! The style of bulb you choose can have a dramatic effect on the overall look of the lamp. Here are some of my favorites. This is a “mirrored” bulb that I bought at CB2. They're also available on Amazon. If you make one I'd LOVE to see it! Share a photo in the comments or tag @primermagazine on Instagram! If you like this DIY project, please share it! And if you check Ebay or AliExpress you can buy “vintage” Edison bulbs made with LED. Even Amazon sells them now. Just search “edison bulb led”. I found these Edison bulbs on amazon. 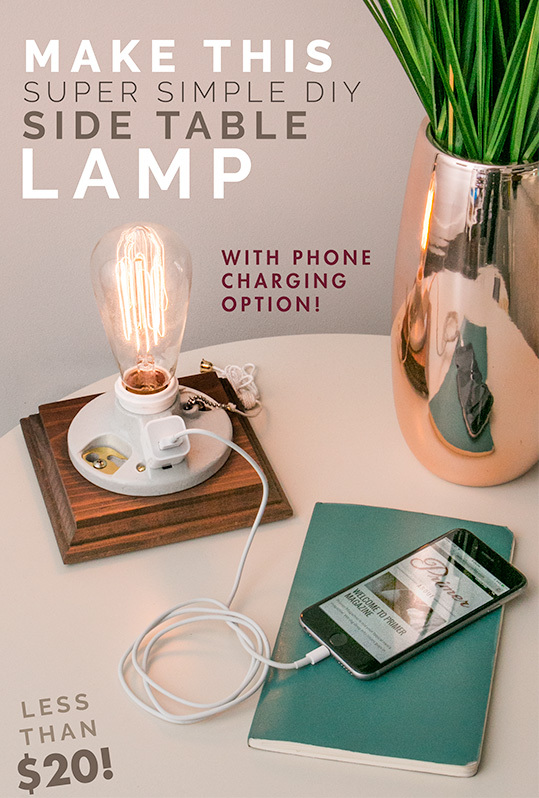 I’m stunned there isn’t a lamp base with a USB plug anywhere on the internet! I almost bought a similar lamp at target this weekend. Looks like a fun one-day build. Unrelated to the lamp: Is there any chance you can specify the brand and model of the eyeglass frames featured in these images? They seem similar to some others I’ve seen online, but I can’t find this precise shape and color combination, which is very nice. Thank. This looks awesome, for my application I might skip the post cap and attach it directly to the table. Pretty Cool- I would add a wifi controlled light bulb that way you can operate from your phone. This allows you to dim when needed as well as have full power. Products like the Phillips Hue also give you full color control creating even more ambiance if you want! A little more pricey but you can set the mood remotely! I’ve seen those, they are pretty cool. I wonder how long they last though. There are wifi controlled outlets and switches that allow you to turn things on and off. Of course you can’t change color or dim with them but they at least allow the basic part of turning it on and off. I have a ton of wifi bulbs in my house- controlled by the Wink Hub from Home Depot. They are all LED and a last forever! Well, I’m going to Home Depot after work. Does the outlet work when the light is turned off? Hey I’m going to make this but thinking more industrial. With. Light cage and using the oil rubbed bronze rustoleum on the cage and over the porcelain. What do you think? Whered you find the cage? I’ll post pictures after I do it. I bought this a while back with the same idea. Problem is, you can’t really tighten that down enough to fit most lamp sockets unless it’s just right. I just have it sitting around unused now. What! This put my Ikea lamp to shame. Especially the charger part. Might just try it. This might be one of the best DIY projects I have ever seen. I’m moving into a new apartment soon and I don’t really like my current bedside lamp, this would be a good replacement. A lot of my design leans toward mid centry modern, it’s nice to have little things like this to contrast with that. Did you get that fence post cap at lowes? I ask because Home Depot didn’t have any I liked so I was going to try lowes tomorrow. Yep from Lowe’s. They were on the end of an aisle. Thanks! Were did you get cord? I bought a 2 prong one, not realizing that I would need a 3 prong to make the outlet work too. I tried to find a 3 prong on Amazon. Just figured I would try there first since I have prime but I had no luck. Were you able to find anything on Amazon? I wasn’t able to find anything on Amazon, surprisingly. A few suggestions from some things I found while looking to build one of these. Amazon has LED Edison style bulbs, use less electricity and you can get brighter bulbs without worrying about the heat, and I also found replacement lamp cords with inline dimmers, not going to want a 60W equivalent burning at full brightness all the time. I finally got around to finishing it. I had a hard time finding the post cap so I had one shipped to my local Home Depot. The routing was less decorative but I like it. I ordered the cloth covered wire and plug from eBay. Finished it off with some red felt on the bottom. Great DIY idea, Andrew. 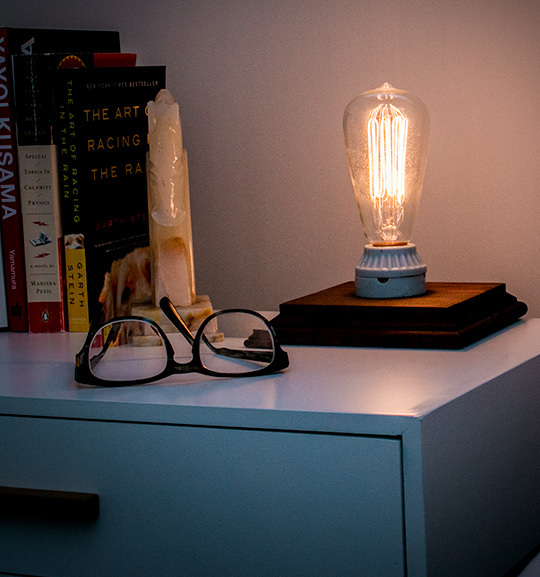 This was the first time doing a project like this,and what a great, fairly simple idea to spruce up your night stand. 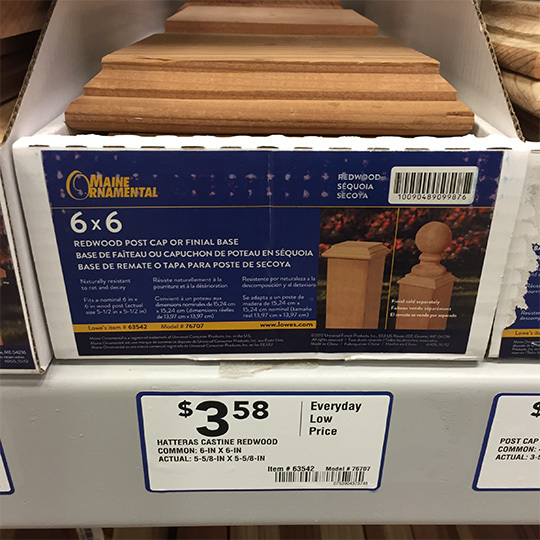 The only problem I ran into was finding the 6×6 redwood decorative cap , which I ended up ordering online from Lowe’s. Just thought I’d share and say thanks for the great Idea. That turned out great!!! Thanks for sharing the pic Ken, I love it. Your lamp looks great, Ken. That alarm clock takes me back to Mom and Dad’s bedside table when I was a kid. I smiled wide when I saw it. I haven’t seen one of those in many years. Thank you very much. I happened upon the alarm clock while helping a friend clean out a camper he inherited, and snapped it up. I love the old school alarm clocks and was thrilled to acquire it! Made one for me and one for Mother’s Day. Both pictured on top of a table I made years ago with instructions from Primer. I found this article just a few months ago and am finally getting around to making it. I did just have one questions/ concern. How do you secure the porcelain base to the wood post? There are screw holes in the porcelain. Good luck, I’d love to see a photo when you’re done! Marvelous diy tutorial.The lamp is easy to make.So helpful.